Home » Cosplay » Win Free Tickets to ComicCon! Win Free Tickets to ComicCon! Alternative fashion brand EMP has teamed up with MCM Comic Con London to offer you the chance to attend the this three-day event spectacular with two FREE tickets to be won this month! This super fun day out is taking place at The Excel Center London on Friday 25th – Sunday 27th May 2018. There will be so many attractions including the MCM Party and Theatre, take part in the Eurocosplay Championships or check out the Comic Village. 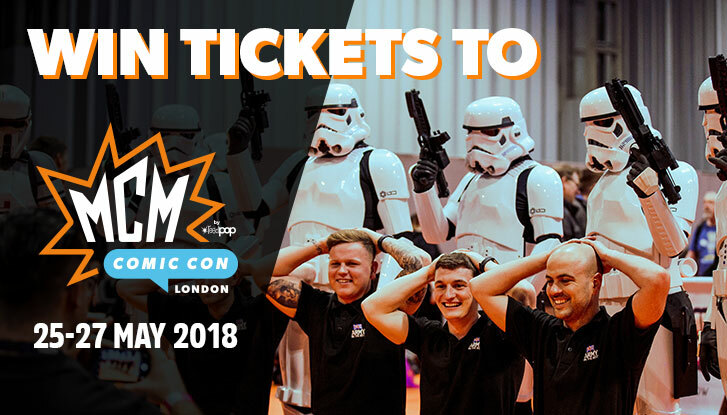 – MCM London Comic Con gives you the chance to meet stars from both big and small screens along games experts and voice artists. – The memorabilia area in MCM London Comic Con brings together stars of the Big and Small screen from yester year, so take the chance of meeting some! – Have your photograph taken in a professional photograph studio at the MCM London Comic Con with the stars in attendance, not only that they are printed and returned to you the same day. – The best dealers from across the UK, Europe and the world bring you the chance to buy collectibles, Anime, Trading Card, Manga, DVD’s, Games, Comics, Toys and a whole load more. – During the MCM London Comic Con you get the chance to play some of the newest games on the market or that are coming to the market and so much more. For your chance to win, all you have to do is answer the very strange question on this page and we will then announce the winner on the 22nd May 2018. 14) Full Terms and Conditions can be obtained by e-mailing: emailing [email protected]. Can You Guess the Years of These Victorian Dresses?